Money is an extremely powerful force and much has been written about its impact on people and society. The current presidential election seems to be juxtaposing the endless greed of the wealthy against the poor less fortunate who struggle to make ends meet. Yes, money can corrupt and yet on the other hand money can also heal. As with all things it really boils down to what you believe. So what do you believe about money? What did you learn about money growing up as a kid? For me, money was always something everyone else had. It was something that you earned if and only if you worked extraordinarily hard. And most importantly … there was never enough! Based on those beliefs, I found myself always working extremely hard and never feeling like I was making the amount of money that I really wanted. After all there is never enough! It took a lot of reading and learning to realize that what I believed about money were simply old beliefs handed down that were based on false information. In other words my premise was wrong! It took awhile, but I now have a different belief system and it seems to be serving me well. You have two choices when it comes to money. You can believe in scarcity and that there will never be enough. Or you can believe in abundance and that there is enough for everyone. Your level of income is directly proportionate to your level of self worth and value. If you want to make a million dollars … find a way to provide a million dollars worth of value first. 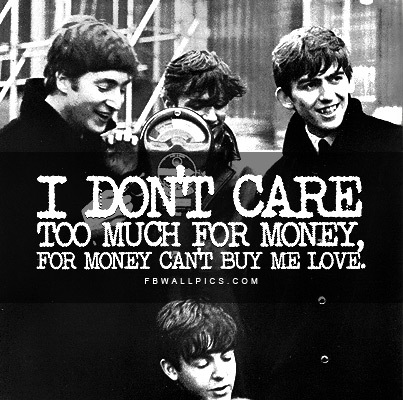 The Beatles were right … money can’t buy you love. The more I give away the more that comes my way. Having a scarcity mentality when it comes to money only attracts more scarcity. Sometimes you have to invest in people instead of equipment. No one else is to blame if I am not making the amount of money that I want … not the government, the president, congress, my clients, my mother, or my kindergarten teacher Misses Shunk who told me there was no such thing as a green flower. Money can’t buy happiness, joy, self worth or value but the pursuit of it can cost you those very things. Money is not evil; it can heal, fix, create growth, feed the hungry, clothe the poor, and heal the sick. It all comes down to whether you are coming from a place of love or a place of fear. So there you have it … and what about you … what do you believe about money and how is it impacting your life?